'Clap!' On Set, The Signature Sound Of The Slate On a movie set, every scene and every take gets "slated" during filming, and there's that distinctive clap sound we all know. But what's it for? The job of the clapper, revealed. 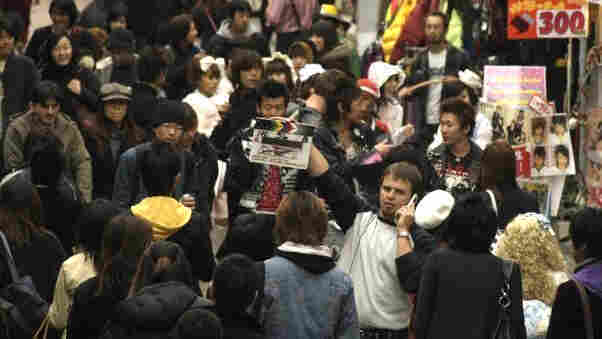 Milan "Miki" Janicin slates a scene on a location shoot for The Fast and the Furious: Tokyo Drift. Given the crowded location, "I'm actually on the phone with my first assistant, so he could let me know when the camera is rolling," Janicin says. Take after take, day after day, some Miki or other on a movie set "hits the sticks" — to synchronize the sound with the pictures. In the silent-film days, it wasn't an issue. But once movies started talking, they needed to figure out how to make the lips and the spoken words move at the same time – because the sound is recorded separately. So someone thought to take two rectangular pieces of wood, hinge them together and then snap them shut in front of the camera before the action began. Later, the sight of the clapper and its distinctive sound on the audio recording could be lined up perfectly. 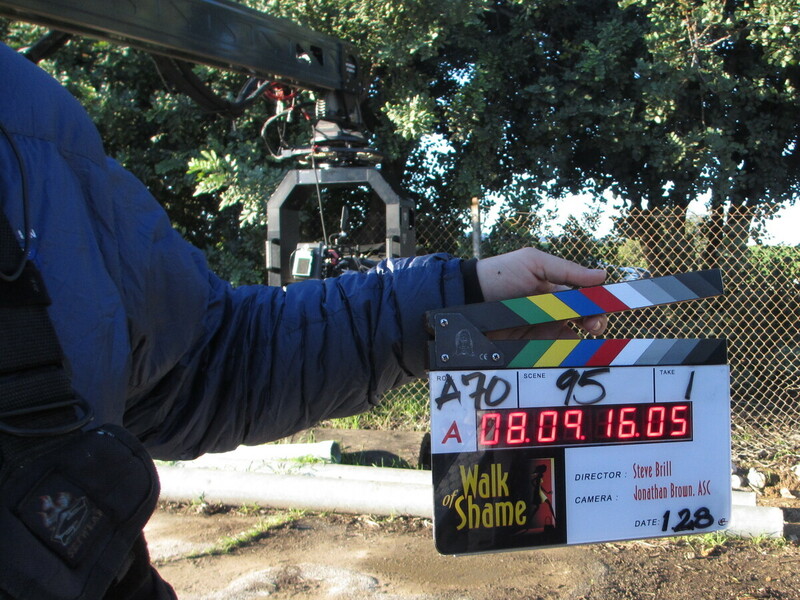 Janicin shows off a "smart slate" on the set of Walk of Shame. The digital timer and embedded chip allow for easy syncing of video and audio in post-production. On a chilly L.A. morning on this set — the film is Walk of Shame — second assistant cameraman Milan "Miki" Janicin, is about to get slapping. In addition to hitting the sticks, he marks the scene and take numbers on a white plexiglass board attached just below the sticks. But when the call comes, it's still "Slate please!" – because, as Janicin explains, "they were actually made out of slate originally, and they would use chalk" to mark the scene and take numbers. That's how you've seen in it the old movies — wooden sticks above a chalkboard. These days it's a fancier contraption. A70: This slate is for the A camera, which is currently on its 70th roll of film (or digital magazine). Scene 95, Take 1: It's the first attempt to shoot the film's 95th scene. 08. 09. 16. 05: It's 8:09 a.m. — more precisely 8:09 and 16 seconds. The 05? That's a frame number. Hollywood cameras typically shoot at 24 frames per second; the slate timer allows filmmakers to pinpoint a moment down to a single frame. "This is what's called a smart slate," Janicin says. There's a digital read out on the slate that runs like a clock in real time: 8 o'clock, 9 minutes 4 seconds, and so on. The digital chip inside is similar to chips loaded into the camera and the sound recorder, so audio and video can be easily synchronized later. But wait: If they've got timecodes and digital sync markers, why do they still need that clap? "That's in case all this technology fails," Janicin says. "We still have that as a backup." Of course – backup. The fancy slate could get wet, the battery could die, and these pieces are not lightweight — they could get dropped! So they have to have the slap sound around, always, just in case. Miki Janicin says there's the occasional director of photography who wants to use the old-style slates — so he keeps one of those in his cart, too. "Some people, because this is called a smart slate, call this a dumb slate," he says. "I call it a standard slate." There's something reassuring about the symbolism of the slate, even though it has essentially been replaced by technology. One director of photography told us that the slate sound creates a kind of tension that makes everybody rise to the level of the shot. It's like, "Listen up, everybody – time to clap-slap-snap to attention." Editor's Note: Like others in his line of work, Miki Janicin was rattled by the death Feb. 20 of 2nd Assistant Camera person Sarah Jones, who was struck by a train while working on the set of the Gregg Allman biopic Midnight Rider. Many of her colleagues have contributed to an online memorial, Slates for Sarah, and, along with her union, the International Cinematographers Guild Local 600, are campaigning to have her honored during the Academy Awards' 'In Memoriam' segment this Sunday.